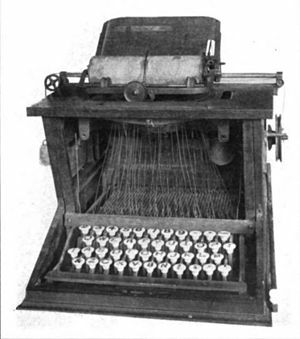 The QWERTY keyboard dates back to the 1870’s, when Milwaukee newspaper editor Christopher Sholes invented a new writing machine dubbed the “Type Writer.” As he refined his keyboard layout, he relied on a study of letter-pair frequency by one Amos Densmore. The goal was to put the most common letter pairs on opposite sides of the keyboard to prevent jamming. How accurate Densmore’s work was is certainly open to scrutiny. The most likely reason he had such an influence on the keyboard layout was that his brother, James Densmore, was funding Sholes’ work on the device. Once the device was sold to Remington (maker of fine firearms no RSM should be without), the keyboard was refined once again, with the QWERTY layout we still use today being set by 1878. There is no way Sholes could have predicted the changes that lay ahead in the century since. Still, if the keyboard is supposed to make the most oft used keys the easiest to reach, this guy was clearly not basing that on English. Didn’t this guy ever watch Wheel of Fortune? Your home keys should include R,S,T,L,N and E. Screw it up from there however you like. Why do we make so many errors (besides the obvious fact that most people are careless, in a hurry or just can’t spell)? Because of QWERTY. More specifically, we make the bulk of our errors because of the awkward grouping of the vowels U, I and O together on the keyboard. Even autocorrect and spell check can’t conquer these mistakes, because hitting the wrong key often creates another perfectly Webster-legit word. And when those vowels are just tiny virtual keys on a phone (and you have fingers roughly the diameter of kielbasas … like some people we know and love) the problem only gets worse. Some of these typos can be bizarre, crude or downright offensive. Just trying rushing through a tweet about shutting your drawers or basting your duck. People have gotten fired for less. This is where Twanglish offers a brilliant solution. Step one: move the I out of its unholy vowel cluster and put it next to the A. (Remember, A may not be where it is now, thanks to the Wheel of Fortune rule mentioned above. Which reminds me, I’ll take the ceramic Dalmatian and put the rest on a Service Merchandise gift card.) That way, if you miss the I while typing “thing,” you end up with a “thang.” Perfectly acceptable in Twanglish. Drink becomes drank, singing becomes sanging. The A and H should live above the E and R, seeing as how many Southerners substitute the “fohmah” for the “lattah” anyhow. This is just the beginning of the revolutionary new Twanglish keyboard. We want to hear from you: what suggestions do you have for refining it?